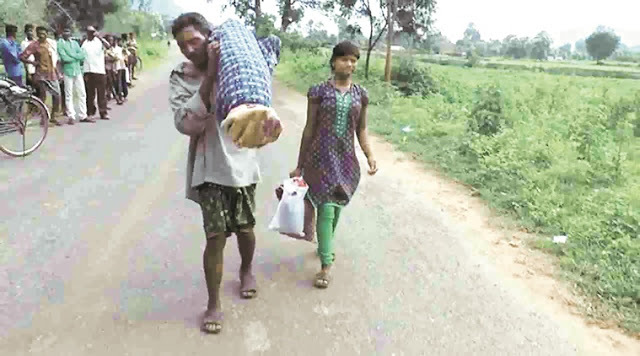 An impoverished man in India carried his wife's body for 12km after the hospital where she died allegedly failed to provide an ambulance to carry the body back to their village. Dana Majhi's wife Amang, 42, died from tuberculosis in the district hospital in Bhawanipatna town in Orissa state. Mr Majhi said his village was 60km (37 miles) away and he couldn't afford to hire a vehicle. "The woman was admitted to the hospital on Tuesday and died the same night. Her husband took away her body without informing any hospital staff," senior medical official B Brahma said. "I kept pleading with the hospital staff to provide a vehicle to carry my wife's body, but to no avail. Since I am a poor man and could not hire a private vehicle, I had no choice but to carry her body on my shoulder," he said. The district collector for Kalahandi (where Bhawanipatna town is located) Brunda D said she arranged a vehicle to transport Amang's body as soon as she came to know about it. "I have asked the local officials to provide 2,000 rupees ($30; £22) to the family under the Harischandra Yojana [a government scheme which entitles poor people the amount to cremate a family member]. Besides, the family would also get 10,000 rupees from the Red Cross," she said. Bahrain’s Prime Minister has reportedly offered financial help to the family of Dana Majhi, who had carried his wife’s body on his shoulders over 12 km. funeral assistance scheme and another Rs 10,000 from the District Red Cross Fund.